“President Trump buoyed the white nationalist movement on Tuesday as no president has done in generations -- equating activists protesting racism with the neo-Nazis and white supremacists who rampaged in Charlottesville, Va., over the weekend. Never has he gone as far in defending their actions as he did during a wild, street-corner shouting match of a news conference in the gilded lobby of Trump Tower, angrily asserting that so-called alt-left activists were just as responsible for the bloody confrontation as marchers brandishing swastikas, Confederate battle flags, anti-Semitic banners and ‘Trump/Pence’ signs. “White rage doesn’t have to wear sheets, burn crosses, or take to the streets. Working the halls of power, it can achieve its ends far more effectively, far more destructively. If you are angry about having to live with a racist president in the White House, this book will make you even angrier. 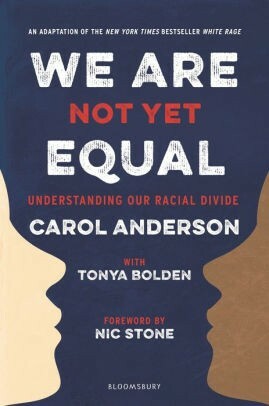 WE ARE NOT YET EQUAL: UNDERSTANDING OUR RACIAL DIVIDE closely examines the policy assaults and legal contortions that were undertaken in response to five American history landmarks that made things more equal for African Americans. These landmarks include the end of the Civil War and ratification of the 13th, 14th, and 15th Amendments; the Great Migration; the Brown v. Board of Education Supreme Court decision; enactment of the Civil Rights Act and Voting Rights Act; and the election of America’s first black president. After reading this history of the deliberately-imposed backward steps that have followed black advancement in America, one could conclude that Trump falls into a rogue’s gallery of racist presidents alongside Andrew Johnson, Richard Nixon, and Ronald Reagan. But there is also abundant evidence here to blemish the legacies of many other white men who have occupied the Oval Office, Congress, various statehouses, and the New York mayor’s office. I pride myself on having read many books that examine aspects and incidents of racism in American history. But I am shocked by how much I didn’t know before reading WE ARE NOT YET EQUAL. There is so much packed into this book, and so much of the history discussed has taken place during my lifetime. Personally, I received a great public education, but had no idea that millions of my generation were deprived of public education by governors, state legislators, and local officials who literally shut down public schools for years rather than comply with the 1954 Brown decision. Despite being an adult consumer of the news during the Iran Contra scandal, I never before understood the full extent to which Reagan mercilessly attacked America’s black communities. This book lays it out clearly. In our recent election cycle, the Georgia Secretary of State (who is now the incoming governor) disenfranchised as many black voters as possible. It is enlightening to read about the genesis of the GOP’s campaign to suppress the black vote under the guise of protecting the integrity of the ballot box from voter fraud. And it is infuriating to read about the latest tricks in the GOP’s repertoire of black voter suppression measures. Which brings us to the authors’ detailed explanation of the Supreme Court’s 2013 evisceration of the Voting Rights Act in Shelby County v. Holder. This is the decision that facilitated all of these new black voter suppression measures. In my opinion, Shelby will go down in American history as being as backward and harmful to America as Dred Scott v. Sandford and Plessy v. Ferguson. From cover to cover, this impeccably-researched and referenced book provides endless examples of how and why we are not yet equal. It will be up to readers to imagine themselves in the shoes of black Americans and to work for fulfilling America’s not-yet-delivered promises of justice and equality for all.